We had quite a surprise when we heard chirping from the incubator yesterday morning... then last night this little one made itself known. I had placed 4 eggs in total (2 had nothing in them after candling) in the incubator on 23rd (so just under 2 weeks ago). I had retrieved these eggs from the ducks nest- under the nesting boxes, in the chicken shed. I placed them in the incubator, as I wasn’t keen to use them- as I couldn’t honestly say how long they had been there. As the mumma duck had not left here nest, whilst either of us were present for about 5 days. Not even for food. The previous week I had managed to coax her so far out to feed, but I think she was far too aware that I was raiding her nest. So my presence even in the shed had begun to stress her. And I had taken to laying food next to the nest, to ensure she was feeding. This in itself had done little to repair our strained relationship. Something she regularly displaced, as she would nip and ‘chip’ at me if I came too close. So as chicks take about 21 days to hatch; though using the incubator, ours seem to be 19-21, obviously this little one had been successfully maturing under the ducks care. It will be interesting to see how far behind the other one is. 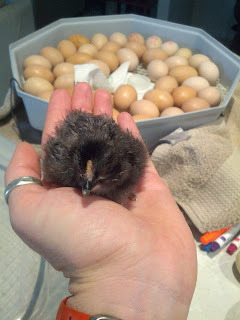 I also placed another 10 in the incubator a few days later. These should have at least another week. But who knows. Have had to mark each egg, so I know hwat is what. 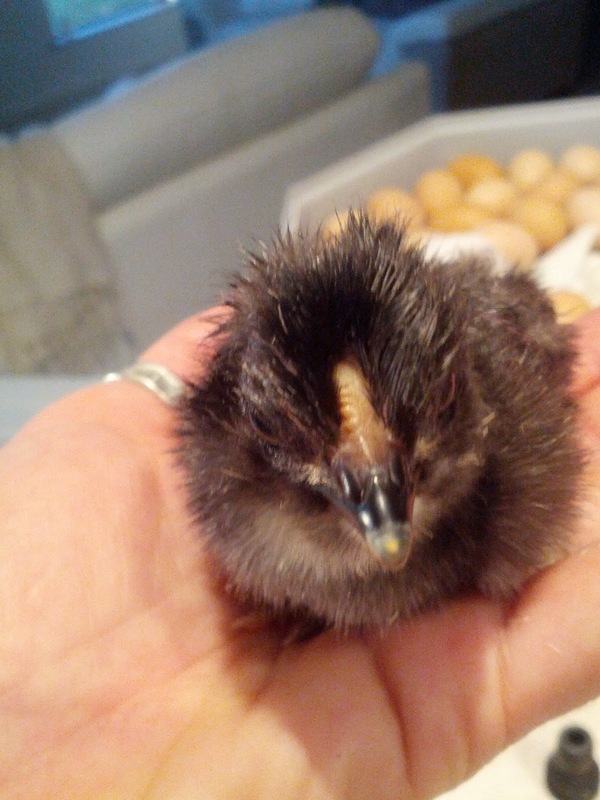 We usually try and hatch chicks weeks appart for ease of housing (brooder boxing). Guess we may just need a few more lights. As we've been adding the Indian game eggs, as they've started laying (and are not notorious for their egg production or fertility rate). So guess you could say we’re just taking our chances as they come. We'll just end up with a few more chicks at different ages, along with the ducklings. Especially since Mumma duck is still sat on 4/5 of her original clutch of 7- they instinctively reject eggs that are not progressing or fertilised, throughout nesting. Along with about another ½ dozen chicken eggs… I just wish they’d lay in their own boxes instead of her nest. We have a second duck nesting just outside the shed, but none of the other birds bother her and her nest.